Citation Information: J Clin Invest. 2018;128(8):3206-3208. https://doi.org/10.1172/JCI122100. APSA undergraduate mentorship program travel awardees and program statistics by year. (A) Undergraduate students from the APSA Undergraduate Mentorship Program pose for a group photo at the 2018 AAP/ASCI/APSA Joint Meeting. These students’ travel was made possible by a grant from the Burroughs Wellcome Fund that sought to increase interest in the physician-scientist career path among URM students. 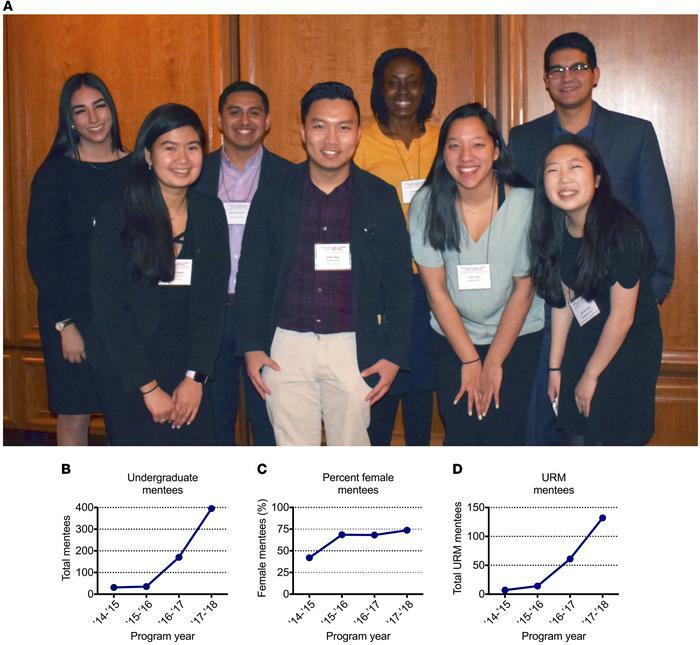 (B–D) Program statistics for the mentorship program by year for total number of undergraduate participants (B), percentage of female undergraduate participants (C), and total number of URM undergraduate participants (D).